BigHorn™ Ramps use advanced recycled composite technology offering the newest in safe, light-weight residential threshold transitions with heavy load capabilities. 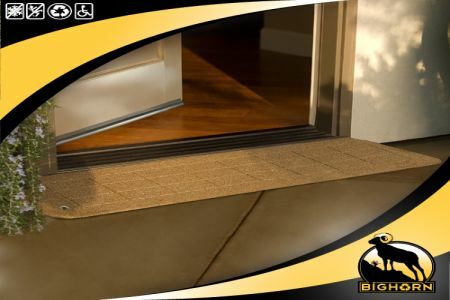 Designed for superior slip-resistance, our StoneCap™ Color Coating technology incorporates ceramic coated quartz crystals, offering an enduring surface that is UV stable and guaranteed not to crack or fade. 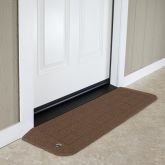 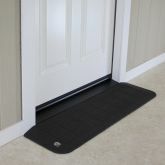 BigHorn™ Ramps modify existing thresholds from 1 1/4″ up to 1 ½” and offer slip-resistant protection and visual appeal. 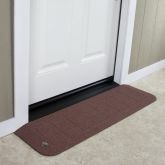 This recycled plastic composite technology is unique in that it conforms to the substrate to for modest crowns and slopes at the threshold, making this the only ramp that is not only extremely durable, but also the only plastic ramp that self-molds to the front and base of the threshold.